Just when you think you know an area like the back of your hand, something pops up out of nowhere to put you back in you place. It all began when Jean-Marc tasted a sample of really lovely St-Emilion 2011 and asked me to go and check out the property first hand to see if the sample matched the wine in barrel. All I had to go on was a mobile number of one Monsieur Cazenave in Saint-Genes des Castillon. I called at least five times the first four were answered but all I could hear was a muffled voice swearing in French at “poches!, trop de poches!, pourquoi les portables si petit, c’est la m***e!” However, on the last call Monsieur Cazenave had managed to get his minuscule mobile out of one of his many pockets and was in fine form! I asked if I could come and visit his cellar to taste his wines which he was very happy about and then proceeded to tell me in the greatest detail (reminiscent of a Fast Show sketch) “turn left after the rotting log then you’ll see a mushroom, turn right here……” and so on. We agreed to meet on Monday at nine in the morning but I would have to call 35 minutes before so he could meet me at the cellar. A bitterly cold Monday soon came and so I called Monsieur Cazenave as agreed. Sure enough, on the fifth call he duly answered but by now I was only 10 minutes away so I had to stop and have a coffee to delay my arrival; the last thing you want to be doing in this situation is be early! I spend much of my daily life (and maybe 99% of my lunchtime life) in an around the village of St-Genes and the road I was instructed to take to get to his cellar I had never even seen! The road winds into some woodland and down into a little valley bordering St-Emilion and Castillon. Fortunately the detailed directions were inch perfect and I soon saw old Monsieur Cazenave jumping up and down waving his arms. The tiny vineyards plot was frozen solid and reading -5°C on the car dash but after a strong hand shake I was ushered into the tiny warm cellar. Monsiuer Cazenave explained to me that he was now in his mid eighties and had studied winemaking at Bordeaux in the 50s under the legendary professor Emile Peynaud. 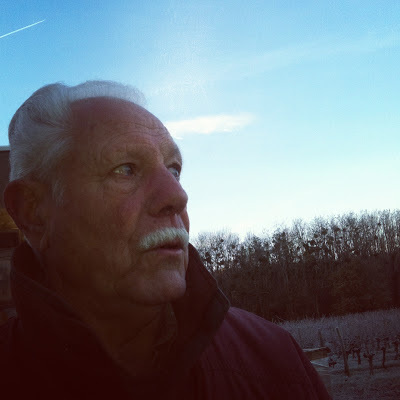 He has been the cellar master/winemaker for many châteaux including Haut-Sarpe, Yon Figeac, Jean Mouiex and Canon and hasn’t missed a vintage since 1947! We taste his wines and they are beautifully made, in a charming, old fashioned style. He told me a story of when the great Emile Peynaud held a tasting for his students and made them taste over-ripe, heavy Bordeaux wines whilst cursing them and saying “trop mûrs, ca jamais tenir la route” (“overripe, they will never last”) and on tasting a pure limestone plateau ripe wine shouting “et voila ca c’est un vin de garde!” (“now that’s a wine to lay down”). 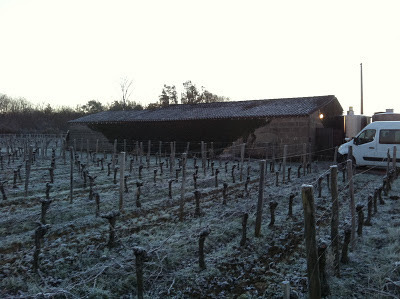 From then on M. Cazenave told me he had always made his wines in the true St.Emilion way. The barrels were as good as the sample and Monsieur Cazenave explained to me that although he loved making the harvest and the wine he didn’t want to bottle too much wine. It was more work to sell and although he looked years from his eighty odd he was keen on slowing down. So I called JMS immediately and we confirmed the purchase of the single vineyard Château Franc Cantenac wine there and then. We bottled the wine days later and if you want to taste a true St-Emilion wine made by one of the most experienced winemakers still around I strongly recommend Monsieur Cazenave’s 2011 Château Franc Cantenac.